The name is legendary, but I’d never seen the place at all until a few weeks ago, and not till this weekend did I pay it a careful visit. Cook County Hospital’s 1913 main building stretches for two city blocks, and is the preeminent example of Beaux Arts architecture in the city of Chicago. It has long been the centerpiece of a densely developed parcel of land, even as urban renewal, decay, parking lots, and freeway construction (all equal blights on society) have smashed the surrounding neighborhoods into oblivion. 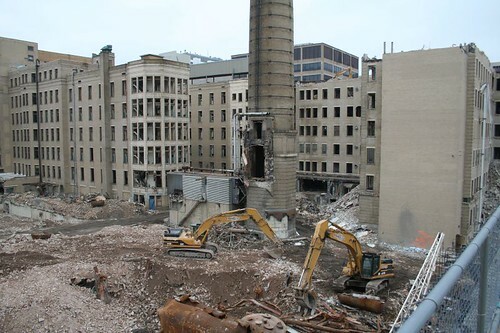 Sadly, they’re tearing down the building’s rear wings, Children’s Hospital and power plant, a complex of structures added in 1914, 1916 and 1926. It’s a compromise — for a long time, the County wanted to tear down the entire building, magnificent front facade and all. The rear pavilions aren’t great works of art, but they have several merits — a creative floor plan that brought natural light to many acres of floor area, and a dense complexity that makes the building look like a city unto itself (much akin to St. Louis’s City Hospital, a likewise neutered complex). A dense, walkable urban environment has become a wasteland of vast parking lots and roaring limited-access lanes. 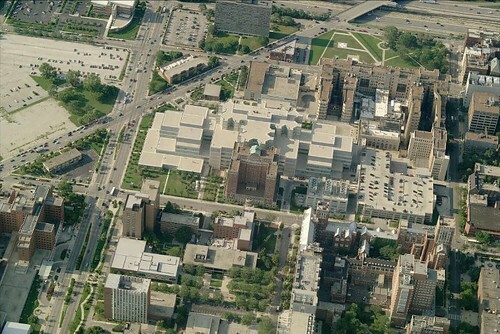 Whatever happens to Cook County Hospital, the most vital battle was lost long ago. The same thing happened to the context around St. Louis City Hospital. 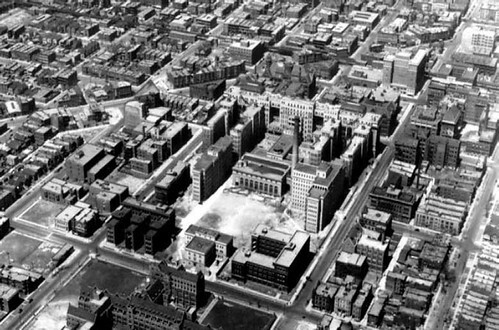 Just like Cook County, City Hospital was located too far from the downtown core to avoid the marginal uses and urban renewal tear-downs that helped build a barrier between central and outer city. 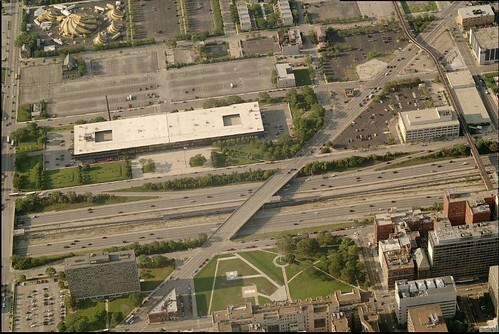 When I used to work at Rush (I left there 7 years ago, before the new CCH building was completed), our corner of the building faced the expressway on one side and the County heliport on the other side. Every so often we’d hear the whump-whump of the helicopter rotors as some poor soul was air transported to the County. 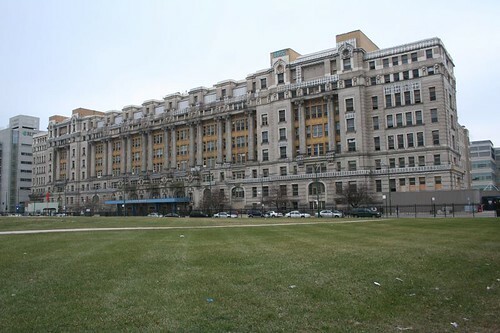 Cook county hospital… an absolutely fabulous building amongst some utter c***. I am an urban design student from the UK who studied in Chicago for a year and lived on the corner of Polk and Damen for that time. 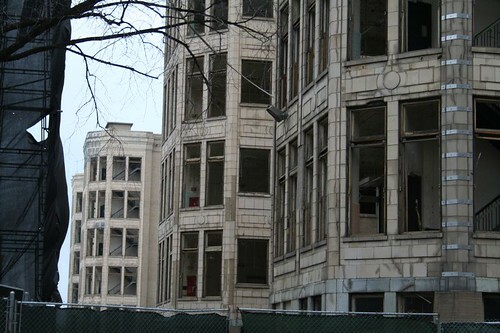 I used to regularly pass the building and think that it is a grade A asset to the city, giving so much historical context that much of Chicago sadly lacks due to demolition; it is an iconic building outside the loop! There are so many ways in which the building could be used now it is no longer a hospital and it would be insane, no CRIMINAL not to make the best of such a beautiful building. I hope when I visit Chicago again, the hospital will not be in the poor state of repair it was… Thanks for the article, I couldn't agree more and the photos are very interesting.